What exciting phases to be a part of! In Intermediate and Senior Phases (known as Intersen Phase) learners are maturing academically, emotionally and socially and we strive to promote the growth of each child as an individual. The classroom focus is on developing children who can think independently, critically and creatively in order to set them apart in a competitive world. Our children are exposed to innovative teaching methods which promote this progress and provide opportunities for learners to be challenged in creative and critical aspects. WHAT HAPPENS WITHIN INTERSEN PHASE? In this dynamic phase we continue to add on the building blocks set in the Foundation Phase using the CAPS (Curriculum Assessment Policy Statement) curriculum, recommended by the Department of Education. 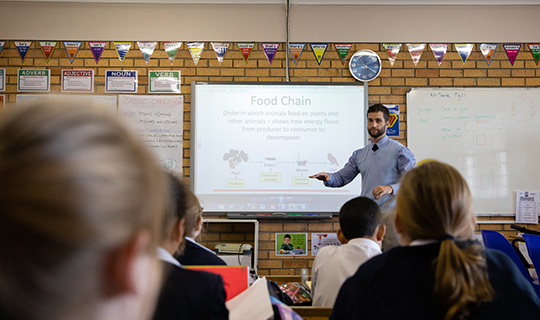 Our excellent and passionate teachers are continually enriching the curriculum with relevant and meaningful content, ensuring that learners are fully engaged within the classroom. Teachers meet regularly to ensure good communication within each Grade in order to maintain a curriculum that keeps pace with the needs of our children. The teachers encourage learners to discover their personal excellence as well as strive to show continued growth. Specialist teachers provide Art, Music, Creativity, Physical Education, Xhosa (as a second additional language) and Library lessons, which further promotes learners’ holistic development and creative thinking. Specialist teachers also provide enrichment, learning support and extra lessons in order to cater for the individual academic needs of children within our daily program. At Kirstenhof Primary School we strive to teach our learners self-discipline and self-motivation by stimulating them to take ownership and responsibility for their own learning.